I was talking to my dad, Paw Paw, on the phone shortly after I read a post by Stefani of The Cupcake Project. Her post was titled three reasons why her pecan pie was better than yours. I told him that for some reason I felt I needed to challenge that. And I did just that. I just might be a little competitive that way. It just so happens that pecan pie is one of his favorite desserts. I was shocked when he suggested that I add chocolate to the pie. He especially likes it that way. Who knew? I would have bet on the fact he would like it the old-fashioned way. I had already decided to make a regular pecan pie, but created this recipe to honor my dad's request. I wish he was here to try it. I guess he will have to enjoy it through here! Bake the pie shell for three minutes at 375 F, set aside to cool. For the brownie layer: stir melted butter, sugar, vanilla and eggs in a large bowl until well blended. Add cocoa, flour, baking powder and salt. Pour into the crust. In a medium-size mixing bowl, add flour and salt to the beaten eggs. Mix well. Add maple syrup, honey and melted butter. Mix together. Stir in the pecans, vinegar and vanilla. Gently pour over the brownie mixture. Bake at 350 F for 40 minutes. If you like fudgy sweet pecan pie... this is YUM! This throw down is serious business! Just wait until you see how the voting turned out! This looks awesome, Carlee! 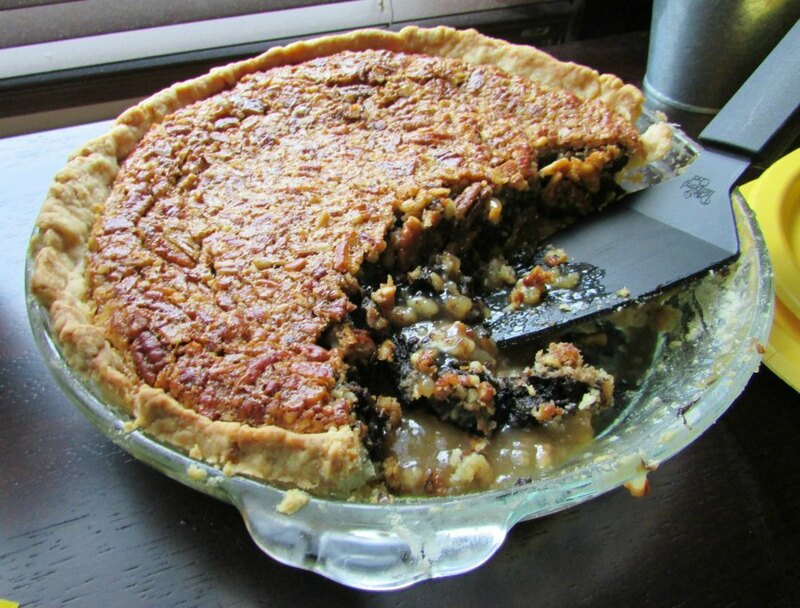 My FIL is a serious pecan pie affectionado and would love this! It's fun to see that you are up to the challenge!! =) Pinned! I had so much fun figuring out how to host the big contest and my mom had a lot of fun trying to decide how defeat the great bacon pie! (I didn't hear any complaints from the tasters either) I can see more throw downs in our future! Wow...I can't wait for an excuse to try this. It is worth coming up with one, that is for sure! Oh. My. Goodness. Pecan pie AND brownies? What even is this? I need to make this yesterday! I am obsessed with pecans! I used to hate nuts for some reason, but once I started making granola, I always buy a pack to throw in and now I don't know what I would do without them. So I finally warmed up to pecan pie as well, and you can bet I'll be trying this recipe! Thank you for sharing it! I hope you love it! I love nuts, but generally not in my desserts. 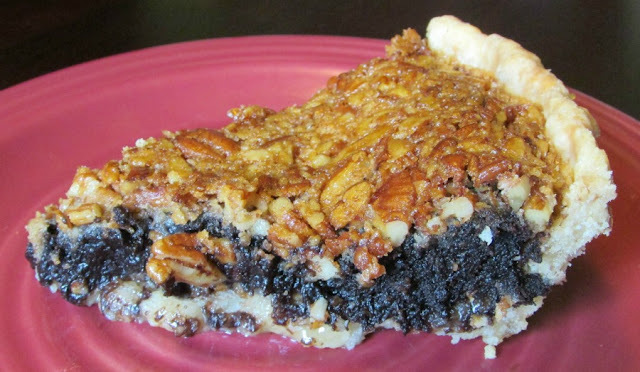 I am usually a brownie purist, but put it in a pie shell and put the pecans on top and I am sold! Loving your post about this. I'm moving to find out the winner. Oh my goodness it was (and decadent too!) Thanks! OMG I think you have created the perfect pecan pie. Thank you for linking up at #HomeMattersParty this week. I hope you will come back next week to link up again. It was pretty darn good! It was so much fun to do the bake off! Thanks for stopping by. Pecan pie is one of my favorites, but adding chocolate? Oh goodness! Thanks for sharing at Talented Tuesday! It really did take it up a notch! Thanks for stopping by. I love this so much I'm featuring you! Thanks for sharing on My 2 Favorite Things on Thursday - Link Party!! Hope to see you again this week!! Love having you!! Pinned!!! Thank you so much!! See you Thursday! Oh my goodness, what an amazing pie! Thanks so much for sharing your awesome recipe with Full Plate Thursday and come back real soon. Thank you! We had so much fun judging the pies and talking about what we like in pies. I can see more taste testings in our future! Thanks Joy! It has been so much fun getting my family's input and encouragement with each little turn this blog takes. They are the best! This pecan pie throw down was a super exciting way to get our family and friends involved in something. Eating pie was a nice perk, but it interesting to see what everyone's suggestions were before and everyone's critiques were after! Thanks so much for stopping by! I could probably do a lot of damage to this pie all by myself:-) It's featured this week on Funtastic Friday. Thanks for linking up and sharing with us. I hope you join us again this week. I won't tell you how much damage I did to this one. It is embarrassing! Thanks for hosting!